Healing and preventing back problems is possible by applying healthy alignment during our daily activities and establishing an intelligent yoga posture practice. In this workshop you will learn the correct movements to improve your alignment and how to recognize poor body mechanics and habits responsible for the most common back pain. Petrina will introduce the principles of the body's energetic and structural patterns in a form of loops and spirals. These principles can be effectively applied to prevent, relieve and heal the back, neck and shoulder pain not only on your yoga mat but throughout your daily activities. 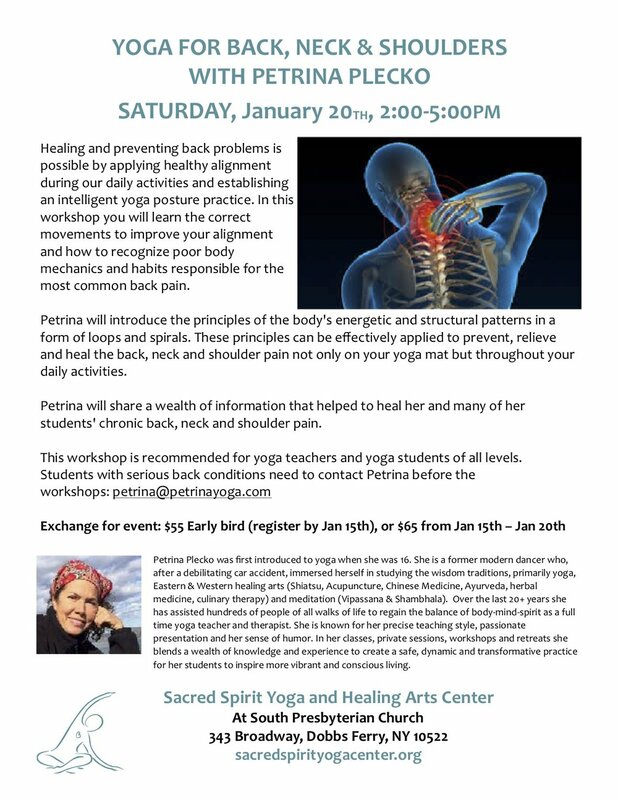 Petrina will share a wealth of information that helped to heal her and many of her students' chronic back, neck and shoulder pain. Petrina Plecko was first introduced to yoga when she was 16. She is a former modern dancer who, after a debilitating car accident, immersed herself in studying the wisdom traditions, primarily yoga, Eastern & Western healing arts (Shiatsu, Acupuncture, Chinese Medicine, Ayurveda, herbal medicine, culinary therapy) and meditation (Vipassana & Shambhala). Over the last 20+ years she has assisted hundreds of people of all walks of life to regain the balance of body-mind-spirit as a full time yoga teacher and therapist. She is known for her precise teaching style, passionate presentation and her sense of humor. In her classes, private sessions, workshops and retreats she blends a wealth of knowledge and experience to create a safe, dynamic and transformative practice for her students to inspire more vibrant and conscious living.